Cocoa powder often referred to as simply cocoa is made of cocoa solids which remain after the extraction of cocoa butter from cacao bins. Cocoa is rich in flavor antioxidants. It is a key ingredient of chocolate. Cocoa powder is used to make hot cocoa, also known as hot chocolate. Hot chocolate can be made with cocoa powder, shaved chocolate, or melted chocolate combined with heated milk or water, and sugar. 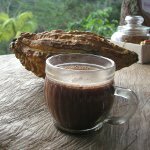 The first cocoa beverage is believed to have been created by the Maya people around two thousand years ago. Of course, it has undergone considerable changes since then. To celebrate the National Cocoa Day, make a cup or two of cocoa to enjoy. Here is a simple hot cocoa recipe. Whisk together 2 tbs of cocoa powder (unsweetened), 1 to 2 tbs sugar, 2 tbs milk and a pinch of salt in a small saucepan over medium-low heat. Make sure that sugar and cocoa are dissolved completely. Whisk in 1 cup of milk and heat over medium heat until hot, whisking occasionally. Stir in 1/4 tsp vanilla extract. If you have lactose intolerance, you can substitute cow milk with almond, soy, or rice milk.